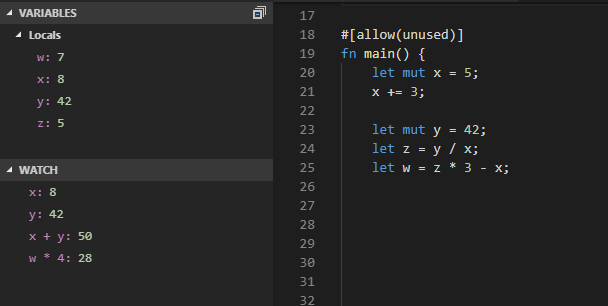 Visual Studio Code is my Rust editor of choice. Unfortunately it can't quite debug Rust out of the box. Configuring the debugger isn't hard. But there are a few steps. I've gone through them several times now. I'm writing this guide to save future me from having to remember them. Hopefully this guide is useful to a few other folks as well. You'll need to install an extension. Which one depends on your platform. It probably makes sense to go ahead and install the Rust extension as well. 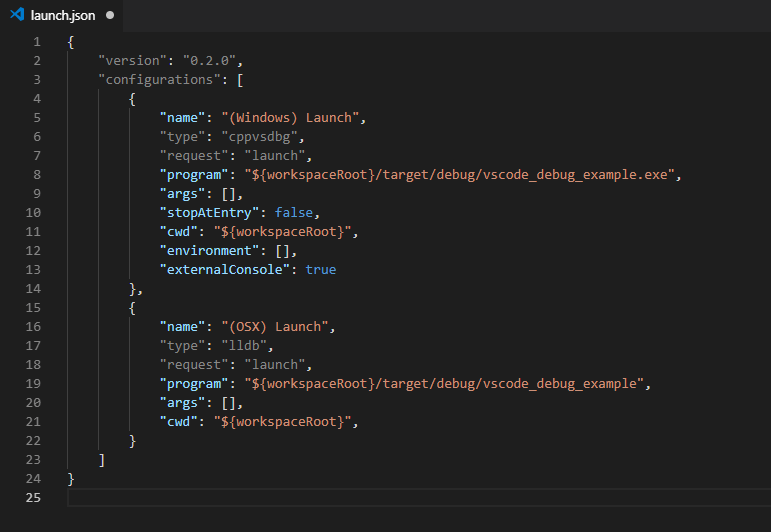 Now that your tools are installed you need to configure your VS Code launch properties. This should create and open launch.json. You'll have to manually change the executable name under "program". Add a breakpoint. Press F5 to launch. Voila! Debugging Rust works pretty well. It's not perfect. But it's pretty good! Basic types work fine. Assuming they aren't optimized away by the compiler, of course. I've found the Rust compiler to be a little more aggressive than C++ when it comes to optimizing away "unused" variables. Sometimes I store intermediate values in variables just for the debugger. Their absence can be mildly annoying. Vectors work just fine. Thankfully. I wish the unexpanded "preview" was more informative. Visual Studio 2017 has natvis for C++. It's not great. I have a lot of complaints. It's way better than Rust's nothing. While working on this post I learned something new. I'm somewhat blown away and want to share it. I was experimenting with the microprofile library. It wasn't behaving quite like I expected so I stepped into the debugger. Much to my surprise I was able to seamlessly step into the crate's Rust code. But what really shocked me is I could also step right into it's underlying C++ code! All of this "just works". No additional configuration needed. You don't have to manuall specify include paths. This is awesome! You can easily step-into crate dependencies. If the crate relies on C++ code then you can debug that too. I had no idea it was this easy. What a delightful surprise! I've put together a small sample project with launch.json pre-configured. This should "just work". I love debuggers. 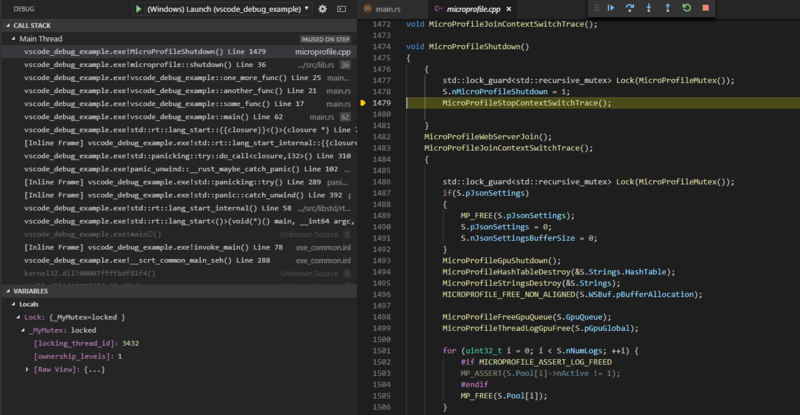 Using VS Code to debug Rust isn't perfect, but it's pretty good. This guide should have everything you need to get started. This should work on any platform. However I've only tested Windows and OS X. If I'm missing a step or the process changes please let me know.